Supernova 1987A in X-rays. 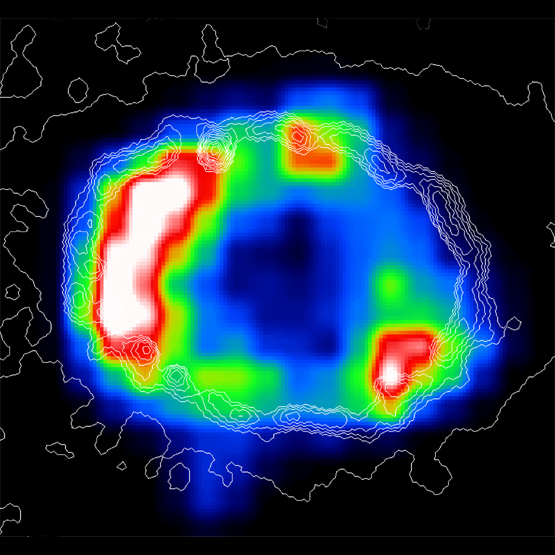 The Chandra X-ray image of SN 1987A made in January 2000 shows an expanding shell of hot gas produced by the supernova explosion. This observation and an earlier Chandra observation in October 1999 are the earliest X-ray images ever made of a shock wave following a supernova event. The colors represent different intensities of X-ray emission, with white being the brightest. Recent optical observations of SN 1987A with the Hubble Space Telescope have revealed gradually brightening hot spots from a ring of matter that was ejected by the star thousands of years before it exploded. Chandra's X-ray image shows the cause for this brightening ring. A shock wave, traveling at a speed of 4,500 kilometers per second (10 million miles per hour), is smashing into portions of the optical ring. The gas in the expanding shell has a temperature of about 10 million degrees Celsius, and is visible only with an X-ray telescope. SN 1987A is in the Large Magellanic Cloud, a nearby galaxy that is 160,000 light years from Earth. Although SN 1987A was a spectacularly violent event, we are watching it from a very safe distance. For a supernova to do real damage to us, it would have to occur at a distance of less than about a hundred light years, more than a thousand times closer than SN1987A. 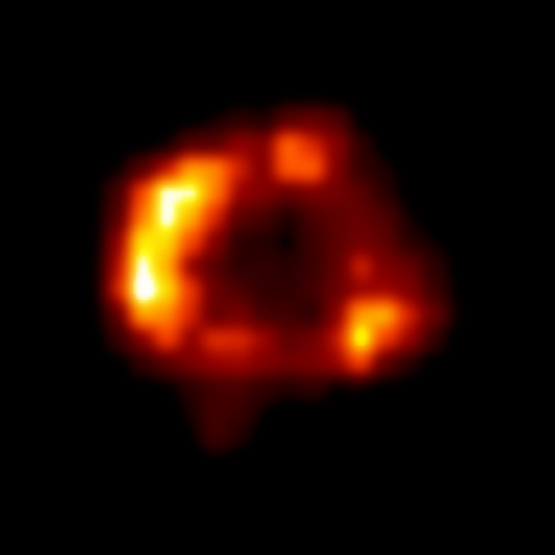 Scale Image is 3 arcsec across. Coordinates (J2000) RA 05h 35m 28.30s | Dec -69° 16' 13"